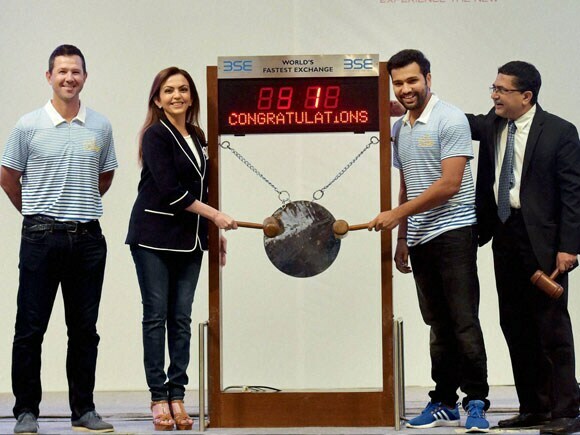 Mumbai Indians owner Nita Ambani, head coach Ricky Ponting and captain Rohit Sharma at the Mumbai Stock Exchange (MSE) building during the Opening Bell Ring ceremonious in Mumbai. Mumbai Indians owner Nita Ambani, head coach Ricky Ponting and captain Rohit Sharma and MD & CEO of BSE Ashishkumar Chauhan at the Mumbai Stock Exchange (MSE) building during the Opening Bell Ring . 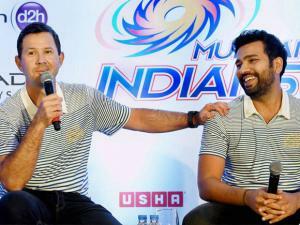 Mumbai Indians' coach Ricky Ponting and captain Rohit Sharma striking a pose after addressing a press conference in Mumbai. 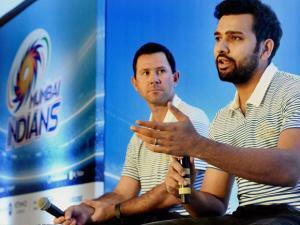 Mumbai Indians' coach Ricky Ponting and captain Rohit Sharma during a press conference in Mumbai. Mumbai Indians' coach Ricky Ponting and captain Rohit Sharma addressing a press conference in Mumbai.